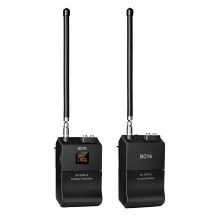 BOYA BY-WFM12 is a 12-Channel VHF Wireless Microphone System, capturing audio with smartphones, DSLRs, camcorders, audio recorders, PCs and more. This system is ideal for interviews, film making, and business presentations, or other applications that require portability. Each transmitter has two MIC sockets, it allows to use two microphones at the same time. High-band VHF operation for superior sound. Widely compatible with smartphones, DSLRs, camcorders, audio recorders, PCs. Compander-free system assures the delivery of high quality audio. 12 switchable frequencies for interference-free operation. Two MIC jacks for transmitter. Automatically matched frequency for receiver. Real-time monitoring capability with included earphone. Operation range up to 40m (131 feet) away without obstacles. Detachable and flexible antenna can be positioned for best reception. Powered by 2pcs AA batteries.